From 2013 to 2016, BYK USA Inc. more than doubled in size due to internal investments and acquisitions. Although BYK was an established SAP shop, its rapid growth required changes to how its different teams and sites worked together. The company wanted to create an environment where all the employees had the same skill sets in SAP ERP, but it did not have the in-house training experts or educational materials to teach this. BYK execs knew they needed something different. Enter ASUG University's in-person SAP ERP 101 workshop. 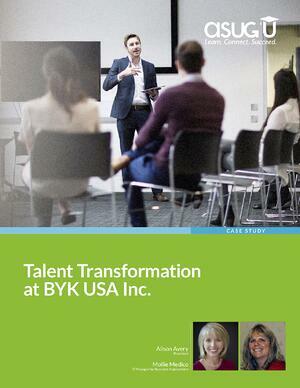 In this case study you'll hear from BYK USA President Alison Avery, and Mollie Medico, IT Manager for Business Applications, about the company's goals going into the training sessions, how the instructors taught the course, who attended the session, and what their feedback was. Download it below!